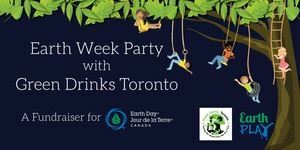 Green Drinks Toronto and Earth Day Canada are once again co-hosting our yearly Earth Week Party, a networking event for environmental leaders and professionals. Join over 300 green champions during Earth Week at the fun and fantastic Rock ’n’ Horse Saloon. Enjoy complimentary snacks, a free drink, and best of all ... ride the mechanical bull! Since its inception in 2010, Green Drinks Toronto has hosted over 300 attendees each year at an Earth Day birthday celebration and networking event, with proceeds going toward Earth Day Canada’s new EarthPLAY program. The audience for this event includes the movers and shakers in the Toronto green industry—architects, designers, engineers, facility managers, developers, politicians, members of the energy sector, academics, and students.We are anticipating a crowd of about 300 attendees. We are thrilled to be hosting the Earth Week Party 2017 at The Rock’n’Horse Saloon. Located in the heart of the entertainment district, Rock‘n’Horse Saloon is Toronto’s hottest Country/Rock destination. Don't miss this sell-out event! Mix, mingle, eat, drink and celebrate for a great cause.